When is Mother's Day in United States? What day is Mother's Day in United States? When is Mother's Day in United States? Question: What day is Mother's Day in United States? Is your mother from United States? Does your mother live in United States? Do you want to find out what day Mother's Day is in United States so you can honor your mother? Let her know how much you love and appreciate her. It's so easy to call, send a card, or have flowers or a gift delivered. Anyway, you have come to the right place to find out when Mother's Day is in United States. Mother's Day in United States is always celebrated and observed on Second Sunday of May each year. Never forget Mother's Day in United States again! 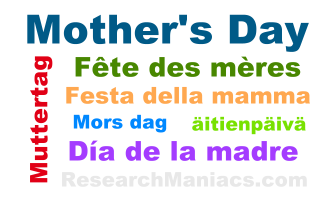 Below is a list of past and future Mother's Days in United States. Add them to your calendar!